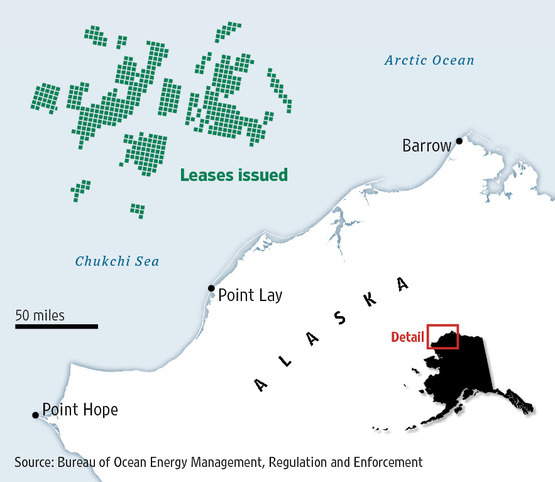 HOUSTON — Heavier than expected ice in Arctic waters off Alaska will likely delay until August Shell’s long-anticipated exploration drilling in the Chukchi and Beaufort Seas, a company spokesman said on Friday. Shell, which wants to search for oil in what are considered remote but promising frontiers, had planned to start the wells this month, said Curtis Smith, a company spokesman in Anchorage. While sea ice cover is sparse in most of the Arctic, ice off Alaska is thicker than in recent years, and that ice is melting fast, according to the US National Snow and Ice Data Centre. Shell plans to drill two wells this year in the Beaufort at a prospect about 20 miles offshore, and three in the Chukchi about 70 miles offshore. Drilling must take place during the brief ice-free season, since federal approvals for the plans require that Shell cease all operations for the year by 31 October. The schedule is especially tight in the Chukchi, where Shell must cease drilling into known hydrocarbon-bearing zones by late September, with top-hole drilling allowed after then, Smith said. This entry was posted in Energy, Environment and tagged alaska, arctic, Chukchi Sea, Shell Oil. Bookmark the permalink.